Mikhail Coloma was born and raised on the island of O‘ahu. He recently completed his B.S. degree in Mechanical Engineering and a minor in Mathematics at UH M?noa, where he was a McNair Scholar. This fall, Mikhail will enter the doctoral program in Mechanical Engineering at Binghamton University. 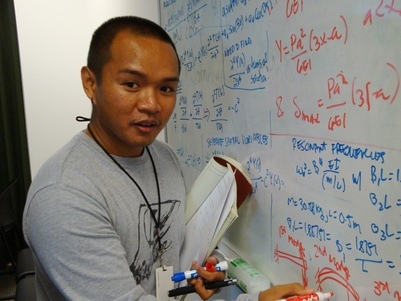 He is interested in computational sciences and methods, particularly as applied to heat transfer and fluid mechanics. Mikhail enjoys studying mathematics, reading textbooks, writing papers, and doing homework. In his spare time, he pursues robotics, event planning, philosophy, and sewing. A study was conducted to design and numerically analyze a telescope mount for the PLANETS (Polarized Light from Atmospheres of Nearby Extra-Terrestrial Systems) telescope that will be built atop Haleakal?, Maui. Using the design concepts of standard trusses, a SolidWorks finite element analysis (FEA) is used to calculate and optimize the resonant frequencies, theoretical weight, and deflection. The results for the current design show a maximum resonant frequency of 30.15 Hz, a minimum weight of 2365 kg, and a minimum deflection of 1.774 mm. This depicts the mechanical behavior and characteristics of the 1.85-m off-axis equatorial PLANETS telescope mount. With more extensive computational computing of the truss geometry, a higher resonant frequency, lower weight, and lower deflection can be achieved. Also, further study can be done on the PLANETS telescope mount by introducing a tensegrity design to compare with the truss structure.